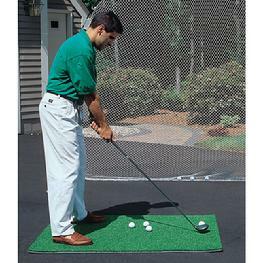 For the protection of your clubs and the hitting surface, always use a golf mat. TheEco Golf Mat is perfect for the beach or boat. This 4 feet by 4 feet range mat weighs 16 pounds and is very high quality. 2 inches thick. Made from recycled rubber and artifical turf. Perfect for hitting golf balls on any surface.